When Acura stuffed the NSX’s hybrid system into its three-row MDX people mover, they did what few rarely achieve: they made a big luxury crossover fun to drive. Not only is the MDX Sport Hybrid one of the most fun factory sleepers you can buy, it’s cheaper than most of its cushy hybrid crossover rivals, too. Acura is trying incredibly hard to reposition itself as a youthful, “sporty” brand again, leading with a pack of hybrid cars geared more towards performance than out-smugging your aging hippie neighbors. The 321 HP MDX Sport Hybrid is a far cry from the Integras that dominated my high school parking lot, but it’s entertaining enough when you mash the go-pedal that I’m actually letting myself get excited about where Acura seems to be going now. You’ll notice right away that Acura is finally phasing out the creepy beak-nose we’ve been looking at for almost a decade, and replacing the faces of its cars with this handsome diamond grille. As a result, the 2017 MDX looks much nicer than its predecessor even though the silhouette is essentially unchanged. The MDX Sport Hybrid takes the regular three-row crossover of the MDX and adds the hybrid system Acura developed for the NSX supercar between its axles. Acura repackaged the NSX’s hybrid system to work with a front-engine CUV, and optimized the gear ratios for more banal, everyday driving. It goes like stink. Bless you, big batteries, for giving us on-demand torque that produces many smiles and giggles. 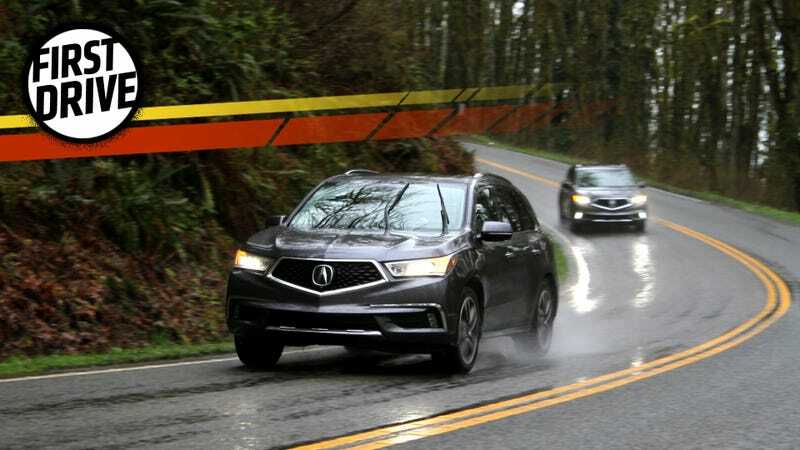 The MDX Sport Hybrid also has what Acura calls “Super Handling All-Wheel Drive,” which utilizes torque vectoring to allow a big, unwieldy beast of a crossover handle and feel more like a regular car. Practically speaking, the vehicle distributes power specifically to the wheels with maximum traction. That translates to quicker cornering with greater stability. The center console is easily big enough to hold a medium-sized purse or alternately, the Easter Bunny. Second row with optional captain’s chairs and console. The seven-speed dual-clutch transmission is also one of the smoothest I’ve ever driven, tuned for maximum comfort. That softness continues inside the MDX as the interior features miles of nice leather. You can even spec the second row as two single seats with their own center console. The MDX is also aggressively priced. The base model comes in at $51,960 before destination fees. That’s $1,075 cheaper than the bizarrely styled Lexus RS450h, $1,540 under the Infiniti QX60 Hybrid and a full $10,140 under the BMW X5 Xdrive 40e. Acura’s big crossover comes with four driving modes that allow it to act like four completely different cars. As you move through the modes from least to most aggressive, the MDX Sport Hybrid’s active damper system stiffens up, the powertrain becomes more responsive, the V6 engine becomes louder, and the controls have more feedback. The MDX Sport Hybrid’s power delivery is fairly linear, with lots of off-the-line grunt. You can nail the throttle on the highway and pass a big truck even in the MDX Sport Hybrid’s most chill “Comfort” mode. You don’t feel the hybrid system or its trick torque vectoring system kick in, it just goes. Red behind the drive mode or gear means Sport mode is engaged. Conveniently you can program the keys to start the car in any mode other than Sport+ by default. If you want to sip fuel in traffic most of the time, set the key to Comfort. If you’re me, you probably want it to open up in Sport. Acura’s claimed specs for the the MDX Sport Hybrid’s 3.0-liter i-VTEC V6 engine and NSX-derived hybrid system—321 horsepower and 289 lb-ft of torque—make it one of the fastest crossovers on the road. Its seven-speed dual-clutch transmission also has a built-in motor that produces up to 47 HP and 109 lb-ft of torque by itself, which acts as a generator for the MDX’s hybrid system. Regenerative braking seamlessly transfers more energy back into the MDX’s batteries when you scrub speed. But when that all manages to move a 4,484-pound (as tested, with the “Advance” options package) behemoth like it’s a regular car and still get a combined 27 miles per gallon in fuel consumption, it’s an impressive feat. The MDX feels safe, and not just because of the five-star crash ratings on the window sticker. Well, only four in rollovers, but the vehicle’s stable enough to keep that from the front of your mind anyway. The hybrid system is positioned low under the floorboard to keep the MDX Sport Hybrid’s center of gravity relatively low. Twenty-six millimeters lower than the regular MDX, even, according to Acura’s engineers. Neat. Standard driver assistance equipment includes a preemptive collision avoidance system that detects and brakes for obstacles ahead, adaptive cruise control, lane keeping and road departure assists. Stability control helps keep the giant box upright and out of trouble. All those driving aids make it easy to cram into small spaces. Little blind spot warnings on the rear-view mirrors help you know when to change lanes on the road. The MDX’s four “Surround View” cameras and front and rear parking assists also help you detect any little ones you might be about to drive over. If you do manage to wipe out or hit “drive” instead of “reverse” from a shopping center parking space, the high-voltage components are placed away from harm between the two axles for maximum protection, mostly between high-rigidity cross members. The battery is designed to disconnect from the motors in a crash. The MDX Sport Hybrid comes with not one, but two screens in its center console. I don’t know what kind of bad trip gave Acura’s design team double-vision before they put this system together, but holy moly, it’s an over-complicated system that takes up valuable dashboard real estate that would be much better served by traditional knobs and buttons. While you can customize what shows on what screen, it gets weird if you select the same thing for both. Putting the stereo controls on the top screen dims the bottom screen if it’s also set to the stereo page. There’s a big knob to control the upper screen, but it’s directly below the bottom screen for maximum confusion. The bottom screen is a touchscreen, which works well, but replaces too many physical buttons. Front seat heating and cooling were there, requiring you to look over into a menu if your bum starts to feel like it’s getting crispy from too much heat. Even more annoyingly hidden is the fan speed, which you can’t grab quickly without messing with the screen. It is nice to set the navigation system in its own screen up top, but that’s the only kind word I have for this setup. I’m also on the fence about the decision to put all the usual shifter functions—park, drive, reverse, and the lot—as buttons. Sure, it saves space and will keep you from accidentally whacking a PRNDL knob en route to your 69-ounce Blerch Gulp. But it requires you to look down to switch into drive from reverse, and just like the vital functions that are hidden on the MDX’s touchscreen, which annoy me greatly. Once you are in motion, the MDX Sport Hybrid’s DCT is mostly smooth but you will feel a slight vibration at crawling slow speeds in heavy traffic. It’s the only flaw I found in the system though, with shifts being so low-drama at higher speeds that part of me would love to see a Nürburgring Nordschleife time on this thing. Those of us who look at large vehicles because our “kids” are race cars or boats, not little humans, will have an additional disappointment with the MDX Sport Hybrid- Acura doesn’t recommend towing with it. You’d have to get the regular, non-hybrid, less powerful MDX to tow anything of size, and even then, that standard all-wheel-drive MDX is only rated for a maximum of 5,000 pounds. That’s pushing it for a car trailer or boats bigger than a Jet Ski. The Acura MDX Sport Hybrid hits dealers next month, and I’d love to see how easy it is to live with for a longer trip where you’d need to use all that space. I’d really love to take this thing camping—tent, food, gear, changes of clothes, and all—to see if it’s still comfortable and quick laden down with stuff, or not. Or better yet, moving heavy car parts around. Empty with one other person as we got to experience on our test drive, it’s fine. But how much can you really haul inside before you start to feel its weight? Does it even matter with those glorious electric motors helping deliver more power, or is there a point where 321 hp isn’t enough? If all you desire in life is to be whisked away from point A to point B in a supremely smooth and cavernous ride, the Acura MDX Sport Hybrid might be your jam. Despite the annoying interior controls, it’s a surprising hoot to drive and a solid contender for King Big Crossover For Parents Who Haven’t Given Up On Life. All of the MDX Sport Hybrid’s torque-vectoring voodoo, low-positioned hybrid system and driver assists make it feel smaller than it is. It’s easy to drive even in heavy traffic, and downright hilarious on the open road. It’s a surprisingly quick and fun huge people-mover, and definitely worth a look despite its interior quirks. Now give us a Nürburgring time.